Finite Elements Analysis (FEA) is a computer based technique used to analyse engineering applications and sealing components to understand their behavior under a variety of conditions. This analysis involves Finite Element Modelling (FEM) which is often used for new component design, or to refine an existing product design. This virtual environment allows PPE engineers to predict how sealing components will perform in real-life applications. Finite Element Analysis (FEA) is used to predict contact forces, deformation and stress levels within elastomer components. In order to maximize the accuracy of modelling, PPE engineers generate temperature specific material models for specific applications. By minimizing stresses within an elastomer we can reduce the effect of stress induced chemical attack and therefore prolong the life of a component in application. Elastomeric FEA is a niche field due to the complex non-linear characteristics of elastomers, in addition to strain rate and temperature dependency, hysteresis, Mullins-effect and stress softening. Another layer of complexity is added by the wide range of compounds, as each elastomer material exhibits different characteristics. For this reason PPE materials undergo specific physical tests to extract the data required to represent them accurately in a virtual environment. Being able to draw from a wide range of in-house compounds and a comprehensive supply chain, our design team are able to recommend the best materials for your application, either using solely elastomers, or augmenting them with metals or thermoplastics. FEA helps the designer to address complex seal geometries, where assessing the sealing force is difficult, both intuitively and to calculate manually. The use of such predictive behavioral programmes can be highly beneficial across a wide range of applications for elastomer seals. Many real-life tests involve complex set-ups, downtime on machinery or expensive laboratory time. The use of FEA may eliminate or at least accelerate the testing programme and is highly likely to be a more cost effective method in assessing the viability of introducing or changing a seal design. By working closely with you we can provide technical expertise to maximize the performance of PPE materials in your application. How can we help? Contact us to discuss your requirements. * Don’t worry we won’t spam you and you can unsubscribe at any time. 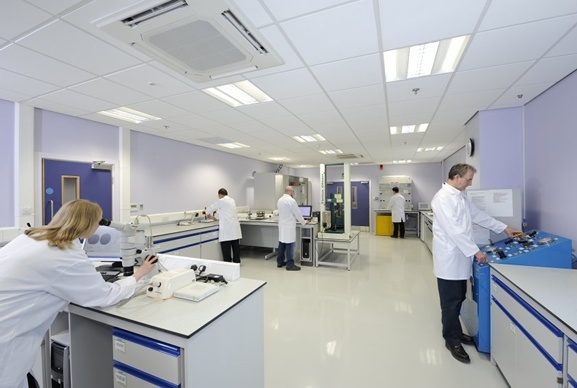 Chemical compatibility, thermo-mechanical evaluation, failure analysis and explosive decompression testing are services available from PPE's laboratories.